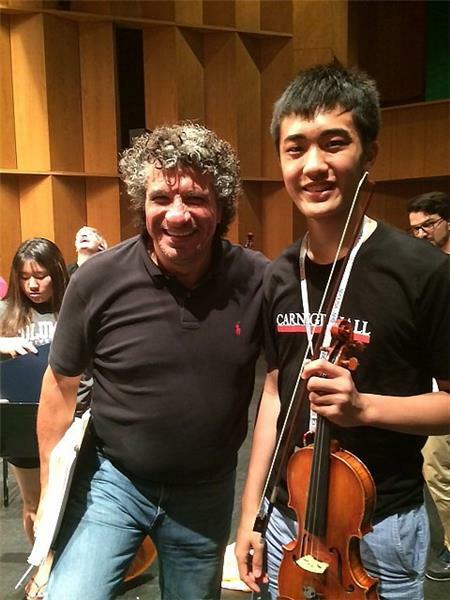 McCallie junior Allen Liu works with Nashville Symphony Director Giancarlo Guerrero during the NYO2 youth orchestra training program. Rising McCallie junior Allen Liu spent two-weeks this summer training and performing with an all-star youth orchestra as part of Carnegie Hall’s NYO2 program. Allen, a day student and violinist from Chattanooga, was selected to participate in the program sponsored by Carnegie Hall’s Weill Music Institute to provide instruction for young American instrumentalists ages 14–17. The program is competitive with all expenses paid for students selected to participate in the program at Purchase College, SUNY, which is just north of New York City in Westchester County. Allen and the other student trained and performed under the direction of Nashville Symphony Director Giancarlo Guerrero, a Grammy Award-winning conductor. He was principal second violin in a performance of Tchaikovsky's "Capriccio Italien," "Pines of Rome," and, as encores, "Hoedown" and an arrangement of themes from "Porgy and Bess." Allen had the opportunity to perform on a masterclass for Hirono Oka and Amy Oshiro-Morales as part of NYO2. As a secondary activity, Allen and other young musicians were placed into chamber music groups and were coached by the Philadelphia Orchestra. In addition to the musical training at NYO2, Allen and his fellow students participated in a social entrepreneurship workshop and competed in a "shark tank" at the end. NYO2 culminated in large side-by-side-by-side-by-side concert with 350 musicians from NYO2, NYO-USA, the Philadelphia Orchestra, and student musicians from the Philadelphia Music Alliance for Youth. Allen shared some of his experiences as participant in NYO2 with a post on the Carnegie Hall website.